When two young English aristrocrats, William Windham et Richard Pocock, discover the Priory of Chamouni 1741, they have no idea that the recital of their visit to this small mountain village and its glaciers, will have an impact on the whole of Europe. Wealthy tourists, in particular the English, come to admire the mysterious Mer de Glace. The huntsmen and crystal-finders, with their knowledege of the mountains, act as their guides. The first inn opens in 1770 and marks the early development of the hotel trade and the first mountaineering exploits. The conquest of mont Blanc in 1786, contributes to the demystification of the summits and seals the destiny of this mountain community. The influence of pre-romantic and romantic writers also helps to alleviate the fear of the unknown and consecrates the mountains as being an expression of nature totally preserved. The first luxury hotel was built in 1816 and the hotel industry continued to thrive through the 1800's, crowned by 3 splendid palaces built in the early 1900's. 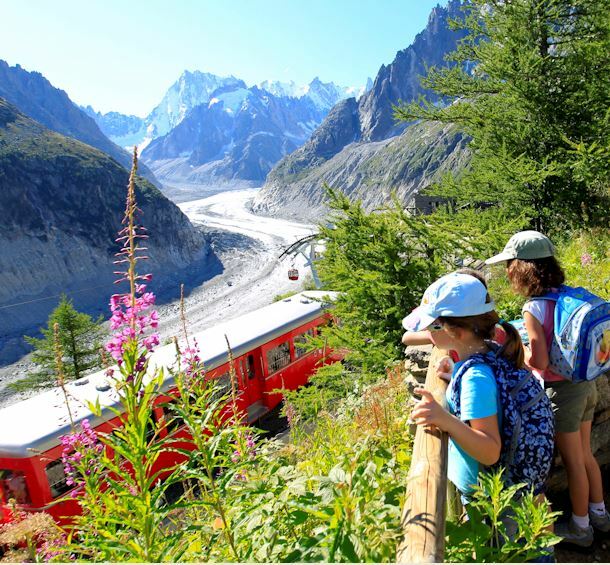 Certain dates are synonymous with the development of summer tourism : the creation of the Compagnie des Guides in 1821 and the inauguration of the Montenvers Mer de Glace cog railway in 1908. 6 years later, there are 39 hotels in the valley ! However the major turning point in Chamonix's development was the creation of road and rail access. In 1866 under the reign of Napoleon III, the first horse-drawn coaches alighted in the village square and in 1901 the railway line between St Gervais Le Fayet and Chamonix was inaugurated. The arrival of the train much improved access to Chamonix in winter and opened the way to winter-sports tourism, with Doctor Payot being the precursor in the valley. The first Winter Olympic games were hosted by Chamonix in 1924 and consecrated the valley as a winter Mecca, with an important number of lifts being built in the ensuing years. First were the Glacier cable cars (no longer existing) and Planpraz, followed by the Brevent, the Aiguille du Midi and the Flégère. Chamonix today, is not only an important tourist destination, but it is also a strategic link with Italy via the Mont-Blanc tunnel. The town strives to maintain a healthy balance between tourist and transport demands and the preservation of an exceptional natural environment. A magnificent fresco dedicated to the famous people who marked the history of our valley awaits you on Rue du Docteur Paccard in Chamonix.